The origins of the rose Mutabilis are unknown but are believed to date back prior to 1894. 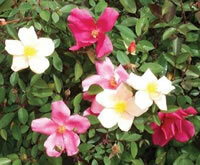 It was first introduced in Switzerland in 1934 as Mutabilis by a rose nursery in Geneva. What two parent plants led to this rose may be unknown, however many gardeners have grown to love this variety for the 3 inch pink blooms it produces that eventually age to a dark crimson color. When Mutabilis is in full bloom with flowers of various ages, it looks like the entire plant is covered in butterflies. 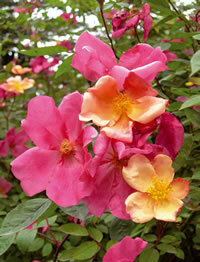 Mutabilis roses will grow anywhere from 4 feet to 10 feet tall with a slightly narrower width. The blooms will start coming in the spring and continue on in flushes for the entire growing season. The blooms on the rose Mutabilis have few petals, only 5 or so per flower, but the transition they make in color is really quite remarkable and it certainly adds a lot of color to any of your landscaping ideas. Mutabilis does much better in the warmer climates of 7 and higher and if often grown as a hedge rose to line a garden or property. The rose Mutabilis is a very vigorous grower and unlike many roses, it has a much higher tolerance for excessive rain and moisture, where other roses would simply not do well. It is also tolerant of shady locations which makes it extremely versatile in the garden. Like most roses however, Mutabilis will do its best work if you can find it a home that gets as much sun light as possible. Especially for repeat bloomers, you really want a spot that gets 6 to 8 hours a day of direct sun light at a minimum. Even though Mutabilis roses are more tolerant of rainfall, they still should have a location where the garden soil has good drainage. Standing water, or soil that stays damp for long periods of time will always be to the detriment of the plant and you will want to avoid these locations. Proper air circulation is also key to a healthy and successful rose. If you can find a place that gets the morning sun light, it will help to burn away the dew that collects on the leaves and keep them drier for longer, reducing the risk of diseases such as blackspot and mildew. Planting the rose Mutabilis is easy and anyone can do it with just a few simple hand tools. Before you start digging, I suggest that you take a trip to your local garden center and pick up a bag of organic compost to mix in with your soil. This stuff makes a great amendment to just about any soil and when you dig your hole, mix it with the soil at a ratio of 2 parts soil to 1 part compost. Your roses will absolutely love it! 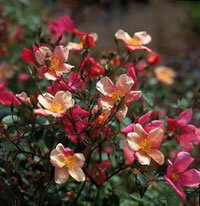 How you go about planting Mutabilis roses depends a little on how and where you purchased them from. If you found them from a local nursery, then they were probably in a container about to bloom, if not already blooming. These are the easiest to plant. Dig yourself a hole that is at least twice the diameter of the container, and equally as deep. This gives you plenty of room around the sides for your new soil mix, while still keeping the bud union at the same depth it was originally planted at. Now if you ordered your rose Mutabilis online, they probably shipped it to you as a bareroot plant and before you put it in the ground, you should soak it overnight in a bucket of lukewarm water to rehydrate the roots and "wake them up". Dig yourself a hole that is wide enough to fit all of the roots of the plant, and deep enough so that you can mound up some soil in the center of the hole for the plant to sit on, and still keep the bud union about an inch or two below the surface of the soil. Once you have your rose Mutabilis set in place, spread all the roots out around the mound and then back fill the hole halfway to start, using your soil mix. Take the garden hose and thoroughly soak the loose soil until it flows like mud, then back fill the hole the rest of the way. This will help ensure that no air pockets have formed around the roots. Taking care of the rose Mutabilis is pretty straight forward and you would care for it just like any other rose. Try to give your roses one deep watering each week but make sure that you are not overwatering them and exposing them to potential diseases like mildew and blackspot. You can check the wetness of the soil by sticking your finger into the soil at the base of the plant, if it comes out wet, it doesn't need watered again. You can feed your Mutabilis roses in early spring when the leaves start to form with a good all-purpose granular fertilizer. For repeat blooming varieties such as this, I will often give them a second dose just as the first big bloom starts to develop, and then a third later on in mid-summer to encourage additional blooms. Pruning the rose Mutabilis is straight forward as well. Start by removing all the dead wood from the plant, as well as any canes that look discolored and unhealthy. Next, cut back any lateral canes that overlap one another so they do not compete for sun light once the leaves have fully opened. Lastly, cut back any remaining canes by about one third of their current height to promote new growth. You should also take this time to rake up around the base of your roses to clean up any dead leaves and debris from the previous year. Never let this material lay around and dispose of this and all cuttings in the trash. Do not throw them in the compost pile as some diseases can survive the cold winter months only to re-infect the plant the following year. 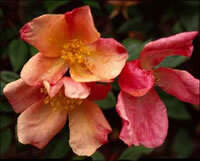 Finish up by giving your rose Mutabilis a generous layer of fresh mulch.